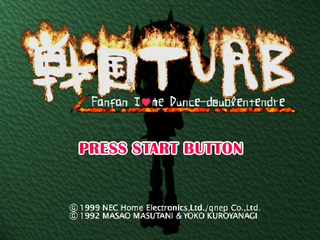 Sengoku Turb: Fanfan I love me Dunce-doublentendre is a follow-up to Sengoku Turb, also released exclusively in Japan in 1999. It appears to be nothing more than a minigame collection hidden underneath the veil of an RPG. Sega of Japan's catalogue page refers to the game as Sengoku Turb: Fanfan I love me Dance-doubletendre, correcting the misspelt "dance" but missing a letter from "entendre". It also abbreviates the name to Sengoku Turb F.I.D..
Main article: Sengoku Turb: Fanfan I love me Dunce-doublentendre/Magazine articles.